The long awaited Reborn: Episode 4 update is finally here. Embark on a brand new chapter in the Phantasy Star Online 2 storyline, explore Tokyo in the year 2028, and become a Summoner after the 15-hour long maintenance. Pick up the latest issue of Famitsu Weekly, out now, and receive an item code for a tact weapon camo and a piece of candy for your pet. Shiki and Oudo will be taking their leave from the lobby during maintenance. Be sure to grab their partner cards before they go! A guide for their client orders can be found here. There are two secret phrases currently active. Be sure to enter them into the in-game chat to receive prizes at a later date. Prepare for the new content by reading up on all the Episode 4 news that we’ve covered on the site. Added skills to all classes! Added New Weapon Category: Tact タクト (AKA Batons). Tacts are not granted with Special Abilities. You can not affix them with Special Abilities from the Item Lab. Added Summoner among the list of possible classes when [Great Success] occurs during Weapon Extension. Tacts themselves are not qualified for Weapon Extensions. ※English quest names are temporary and will change to reflect the patch. 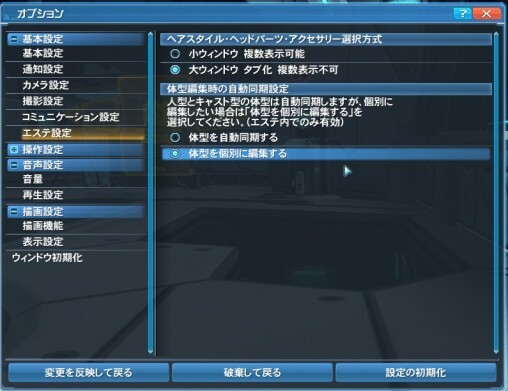 ※Each Arks Quest and Free Field listed above supports [N ~ XH] difficulties. The Bridge can be accessed only from [EP4 Mode]. Story Boards are accessible only from [EP4 Mode]. 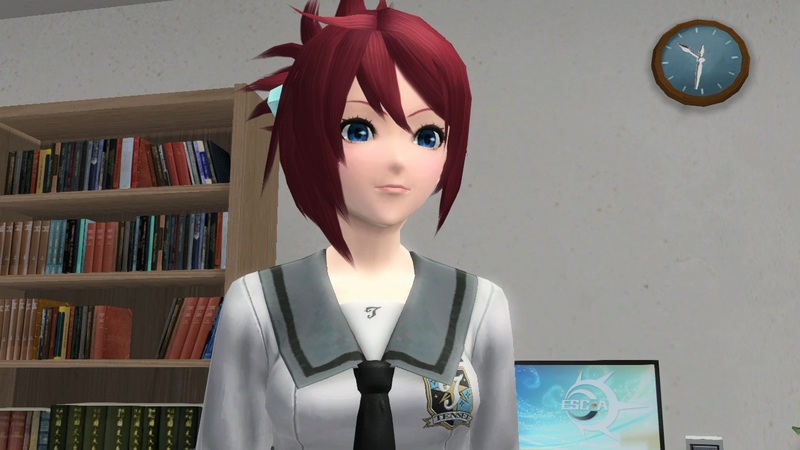 A 16-year-old high school student at Tensei Academy. A mysterious boy, bereft of his memories, who was given the name “Aru” by Hitsugi. Hitsugi’s fellow high school student and closest friend. Created by Xiao, she serves as the Player Character’s operator. Changed the Photon Arts / Technics you initially learn when creating a new character. Changed the Jet Boots PA Icon colors from red to yellow. This update changes which fields are unlocked through Koffie’s Client Orders. Exploration Request II will now unlock Desert, Coast, & Kuronia. This update will also change which client orders are unlocked when you clear specific quests. Io’s Client Orders will unlock when you clear Nab Rappy Capture or complete your Mag License Order. Faina’s Client Orders unlock when you clear [Tokyo Exploration]. Changed the Daily Orders and Team Orders that appears after this update. Other changes to unlockables can be read here. EP3 Afin: Clear 異常発生の影響は “The Plague’s Effects” Client Order from Afin. EP1 Echo: Clear the B-Route for “Eerie Naberius” Story Quest. EP3 Echo: Clear 異常発生の影響は “Seeking the Trivial” Client order from Echo. EP4 Io: Clear Just Attack Training VI Client Order from Io. Players who cleared the above mentioned client orders/story quests before the update, can perform the following actions to receive the Partner Card. Changed Lottie’s Outfit to Zip Combination. Changed Lubert’s outfit to Cradel Coat. You’ll get two versions of their Partner Cards, with both new and old costumes. Added [Special Gifts] as a reward for clearing the Featured Quest. Featured Quests will now be unlocked when the Tokyo Free Field quest is cleared. Changed some specifications of contents with “The Long Awaited Tomorrow” Story Quest. Changed some specifications of contents with the tutorial for the “Long Awaited Tomorrow” Story Quest. Changed the final enemy in the “The Long Awaited Tomorrow” to El Ahda, and adjusted the dropped PA/Tech discs. Added a drop item for Summoner Class in the “Heaven and Hell” Extreme Quest. A Solo Quest where players can expect rare drops, high EXP, and Meseta. A Bonus Key is required to start the quest. Bonus Keys will expire after some period of time has passed. Story Quests [EP1] + [EP2] +[EP3] will will not appear if Episode 4 is selected on startup. Adjusted some of the backdrop/scenery graphics with the [Nightscape] Team Room. Added the [納刀位置調整] Sheathed Position Adjustment feature to “Custom” in the Main Menu. This feature allows you to adjust the positioning of your sheathed weapons. The layout of the Quick Menu can be changed into 11 different patterns. Each pattern represents a different purpose. Added options in the Quick Menu to [Head to the Bridge] and [Head to the Beauty Salon]. Deleted and added some lessons. Added a feature on the character selection screen that allows you to view how many characters you have on other ships. You may now create up to three free characters! Players who already have 3 or more characters will be given 1 [Character Creation Pass]. You can create up to 20 characters on your account. Implemented the “Layered Costume” system, and added its supporting Innerwear, Basewear, and Outerwear articles of clothing. Added [Fashion Edit] which allows you to equip various articles of clothing, accessories, and hairstyles outside of the Beauty Salon. The changing of accessories will now be performed through the [Fashion Edit] menu when the player is outside of the Salon. [Fashion Edit] will not be available on challenge blocks of Shared Ships. [My Fashion] can be saved and loaded through the [Fashion Edit] menu or through the [Beauty Salon]. Added menu listing for Innerwear, Basewear, and Outerwear in the Salon. Added a feature that lets you set your favorite hairstyles and accessories. You can now overwrite your Character Creation data. Added an option to allow Casts to save their Humanoid and Cast forms separately. Your Cast’s mag color will correspond to the Main Color of your Outerwear, or your most recently equipped costume/parts. A confirmation message will display when you press the “All-Random” button in Character Creation and Support Partner Creation. In the PC version, Hairstyles and Head Parts will now be shown in a larger window. 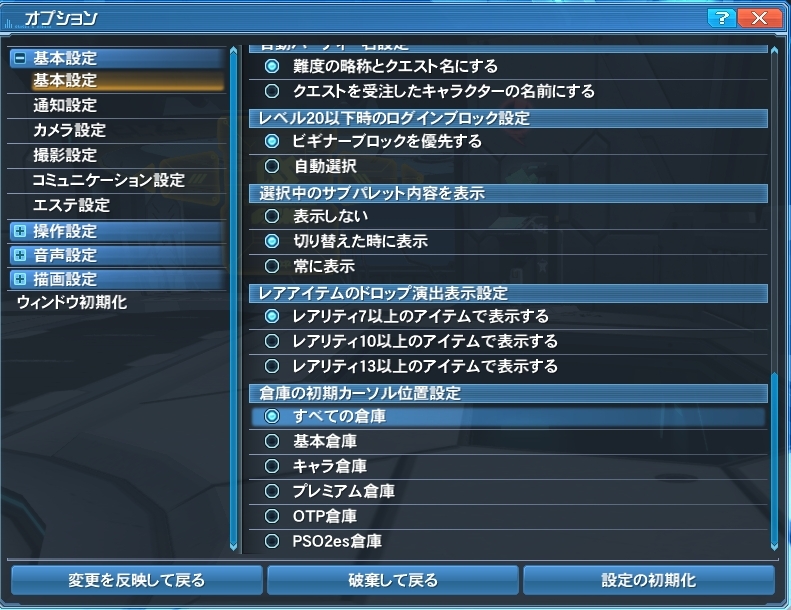 For the [Accessory Selection Method] in options, PSO2 will select [Large Window Tabbed] by default. The Ship Transfer sale has ended. Ship Transfers will be priced at the regular 700 AC. Item Pack can now be expanded to 150 slots. Premium Storage has expanded to hold up to 400 slots. Character Storage has been added for each character. PSO2es Storage has been added for players who log into PSO2es with linked characters. 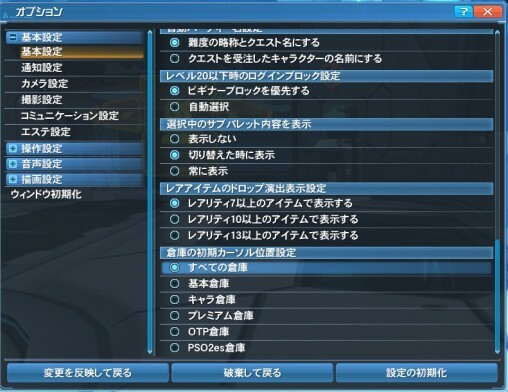 You will no longer be able to store items in PSO2es Storage after 1 month of not logging into PSO2es. In Options you can set the initial cursor position for the Storage menu. 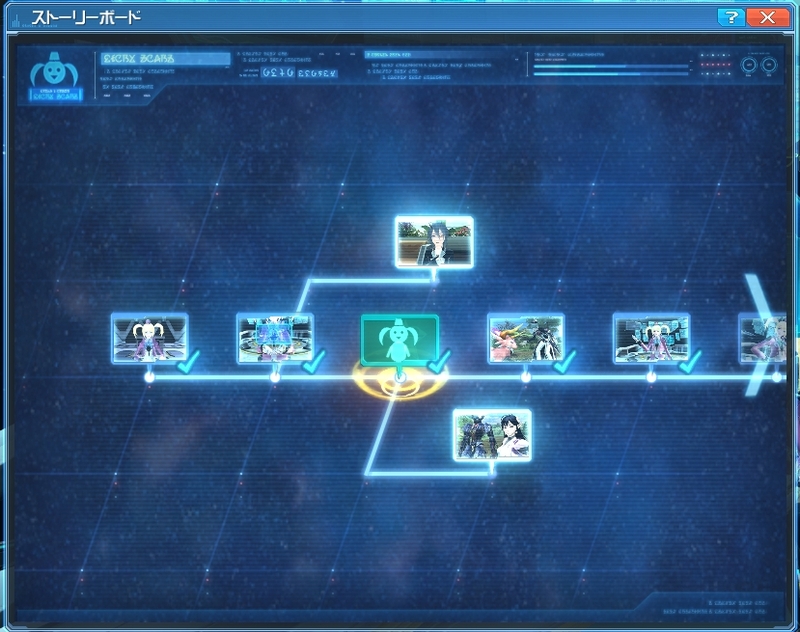 All Storage, Basic Storage, Character Storage, Premium Storage, OTP Storage, and PSO2es Storage are among the possible choices. This section only pertains to limitations for [Extra Storage] boxes. [Extra Storage] is an optional storage option that can be rented with AC. You will no longer be able to send items to your [Extra Storage] box from your [Item Pack]. However, you can avoid this restriction by setting one of your [Extra Storage] boxes as your [Favorite Storage]. Doing so allows you to send items to 1 of your [Extra Storage] boxes even when you’re in a quest. The [Favorite Storage] setting is shared to characters under the same ship. The Box selected as your [Favorite Storage] will appear with a star next to it. You can press the [X] button on the gamepad to set your favorite storage. The [All Storage] button will display items from the most recently accessed [Extra Storage Box]. Your [Favorite Storage], if set, will take over as the most recently accessed [Extra Storage] box. You will no longer be able to send items from one [Extra Storage] box to another [Extra Storage] box. My Shops will allow you to list items to the market using 1 of your [Extra Storage] boxes. You won’t be able to list items from another [Extra Storage] box until you finish or withdraw the current listing. An [Extra Storage] box must be selected first, before you can transfer items to it from the Storage Terminal. Items that were registered as “My Set” equipment will no longer be taken out if it was stored in an [Extra Storage] box. You can circumvent this by setting an [Extra Storage] box as your [Favorite Storage]. In order to display items in a particular [Extra Storage] box, you’ll need to first select its corresponding [Extra Storage] Box. Room Items will no longer list [Extra Storage 1 ~ 5] as an available source for placing decorations. You can circumvent this by setting an [Extra Storage] box as your [Favorite Storage]. Doing so allows the item to be listed when the [All Storage] button is clicked. Added some new Potential Abilities. Added new items called Egg. Added the Candy Box system. Added items to the Pet Items Shop. Added items to the Badge&Memory Exchange listing. Updated the My Room Shop listing. Added items to the Costume Shop listing. Added items to the Casino Prize Shop counter. Added items to the Challenge Mile Shop. Added items to the Pyroxene, God Stone, and Phantasmal Stone Shop. Added [Phantom Stone Exchange] to the Pyroxene Shop. Added キャラ倉庫拡張５０ (Character Storage Expansion +50) to the AC Shop. Changed the PSO2 icon in the PC version. Added a button that directs you into getting a SEGA ID on the login screen. Changed the appearances of certain NPCs. You can now skip the following animations by pressing a button. When you identify an Item at the Tekker. Adjusted the water graphics on some fields. Changed the conditions to display some tutorials. Changed when some Tutorials appear. Changed the contents of the Tutorial when you start the game. Changed the tutorial’s listing in the Event Chronicle. Changed some of the video entries in the Event Chronicle. The above events can be viewed in the “Other” section of EP3’s Event Chronicle. You will no longer be able to play AC Scratch when your Storage doesn’t have 4 or more free spaces. Changed the Lambda Grinder’s rarity to ★7. Adjusted when certain notifications appear during Tutorials and the Camp Ship. Changed the locations of certain Shops. Increased the Client Order Item drop rate for Koffie’s [Free Exploration: Forest] and [Free Exploration: Desert]. Increased the EXP earned from certain Client Order from Afin and Jean. Adjusted the clear conditions for Nagisa’s Client Orders. 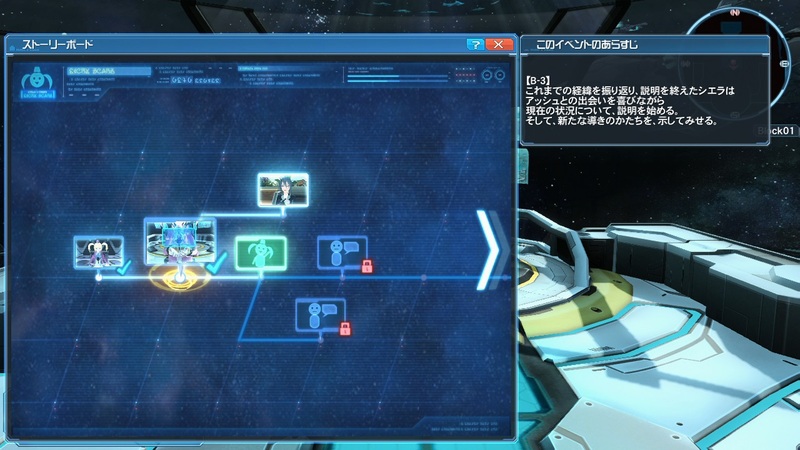 Increased the speed and range in which you automatically pick up Meseta. The green nodes on the Story Board require specific actions before they unlock the route. Each Featured Quest will gift you one present per day if you clear the quest at A Rank or higher. 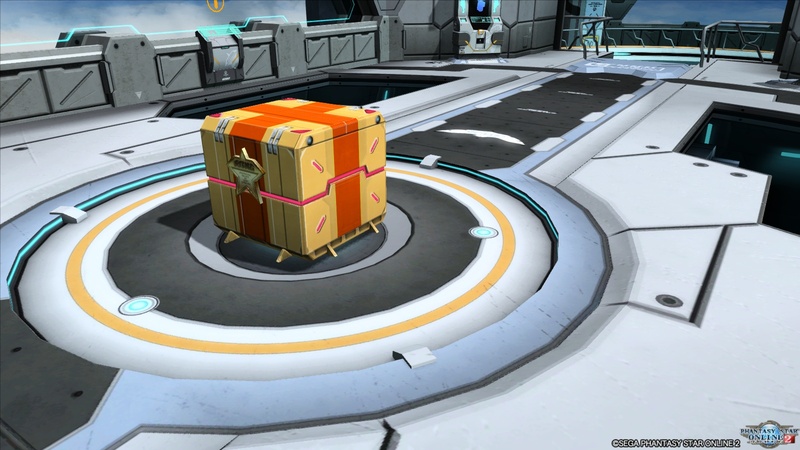 The prizes in this box are random, but sometimes you’ll be awarded with an item called a ボーナスキー (Bonus Key). ボーナスキー東京【銀】 (Tokyo Bonus Key [Silver]. 特別任務：東京【銀】 requires the [Silver Key] whereas 特別任務：東京【金】 requires the [Gold Key]. Please be aware that Bonus Keys will expire after several days have passed. You can now set the Initial Cursor Position when accessing the Storage Terminal. From the Options menu, you can set if your Cast and Humanoid forms will have different body types. 体型を自動同期する Automatically sync their body types. 体型を個別に編集する Edit the body types separately. New players who register an account within the campaign period after Episode 4’s launch will be eligible for a starter pack of items! Until maintenance on May 25th. Join a team and help out by completing objectives to receive prizes! Join or already be in a team with four or more players to receive one +100% Tribooster. Earn additional rewards by clearing the selected objective each week of the campaign. Players returning from hiatus for the start Episode 4 are in for a treat of 255 items! This campaign applies only to those who haven’t logged in since maintenance on December 22nd, 2015. Until maintenance on June 1st. 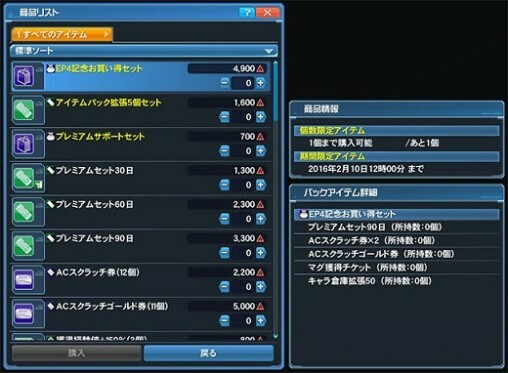 If those same players say ただいま in team chat during the campaign period, everyone in the team will receive a +100% Tribooster in late March. All team members will receive an additional Tribooster for each player in the team that is eligible for the campaign (up to a maximum of three). Presents will be delivered late March for all members who belonged to the team by March 2nd. Purchase AC Shop items at a discounted rate between January 27th ~ February 10th. ※ Purchasing the 90-Day Premium Set through this method also qualifies you for the Premium Set Purchasing campaign. So for the phrases, i literally just copy and paste them into game chat and press enter? I just realized they haven’t mentioned increasing level cap? Indeed. Because there’s been zero indication anywhere that they’re going to raise it anytime soon. pso2 animation quiz, get the prize per character or per account? Stage 6 Graphics are coming later in the Spring, alongside the PS4 release, right? Well I think PS4 is due a little sooner. Like maybe a few weeks. But i’d say they will be released relatively close. The road map made it look like PS4 will get Stage 6 first with a PC release soon after. Just the PS4 closed beta runs until 6th of March you know. i think he’s saying the ps4 version is due a few weeks earlier than the update for the pc version that brings graphics level 6, not that the ps4 version will be released in a few weeks. i’m pretty sure you just don’t understand how words work. “yes, this thing is happening in a few months, but i think the other thing is happening a little sooner, by maybe a few weeks.” is how you should be reading it. i read your original comment and reaper’s before what you were replying to and had a hard time understanding how you got so confused. A large part of reading comprehension is being able to recognize what isn’t said explicitly, and being able to fill in the blanks based on what’s there. Another large part of reading comprehension is WANTING to correctly read things. From what I can tell, he either doesn’t want to try or just hates admitting to having make mistakes. If either of these things are true, then trying to tell him what he did wrong is a waste of time. People who hate to admit when they’ve made a mistake are far too common on the internet from what I’ve seen and I’ve yet to find a way to convince them how much worse they make themselves look. The point is readers should not have to play a guessing game with poitnlessly and chronically unclear wording. Especially on the Internet where it’s always safer to assume that, in Tegnér’s pithy phrase, “what you cannot clearly say you do not know”. Not to mention the only too real risk of spreading misunderstandings of the topic in question, which is the specific reason I made a point of linking to the correct info in the first reply. Stage 6 graphics settings should be coming April 20th. just to ask when you log in game do you start at EP4 *not as new player but old as dinosaur XD * and can not go back to EP3 unless you did half matter board episode 4 ? Basically, yeah. Didn’t progress far enough on it (thanks, random 630) to know where the “point of return” is though. Is there an ETA on when its gonna go online? It’ll be back up and running in not time pumpkin sweets, you’ll be wasting your time like a pro sooner than later. It is probably just a sizing glitch, it might be more because it said: “with pre patch 517mb’s” “without prepatch 4.0gb’s” so that might be the remainder amount of pre patch or patch. Would it be said for the Vita version as well? I don’t want to go shopping for a 16GB Memory Card just yet, since I want to get back on the Vita version for the sake of writing something for the game. so.. what should I do then??? ._. 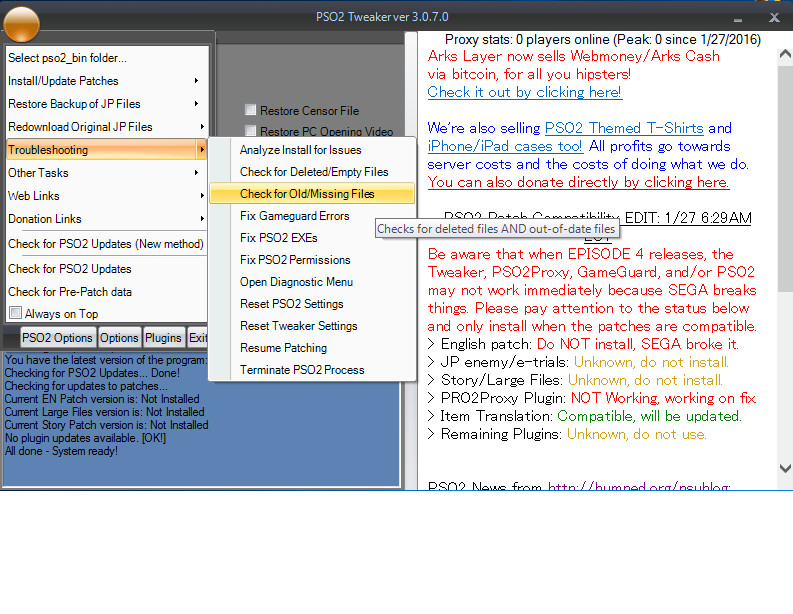 Hello, anyone can explain to me what happened to my pso2 tweaker/pso2 files? About 30 minutes ago, I opened my tweaker and everything there is fine, and then a few minutes ago I decided to open my tweaker again and now I have like 2000+ missing files? I forgot to add that I’ve already downloaded the pre-patch 3.7 GB (PC) and the additional 575 MB (if pre patched) before that happened. I’m pretty sure its SEGA releasing new files/fixes/whatever and Tweaker is just downloading them. I had to download a good chunck of extra files when I openend the tweaker 2-3hrs later after maint supposedly ended. So, at this rate, Tweaker gonna keep downloading files as SEGA spits them out. Thanks goodness I have a backup of pre-cede files saved in other folder. I just made a copy of that again and I put it where my pso2 is, somehow it prevented the tweaker from downloading the files again. Sure, I’ll try doing that. By the way, I noticed your tweaker is on the latest version (3.0.7.0). I’m still using 3.0.6.9, and whenever I try to update my tweaker, I get the “something went wrong” message and it opens a pop up window asking my permission to send the log files so it can be fixed. Then later on, I can see two tweaker window open on my screen, the latest and my old one. Also if I close the two window and open the tweaker again, it keeps reverting back to 3.0.6.9. 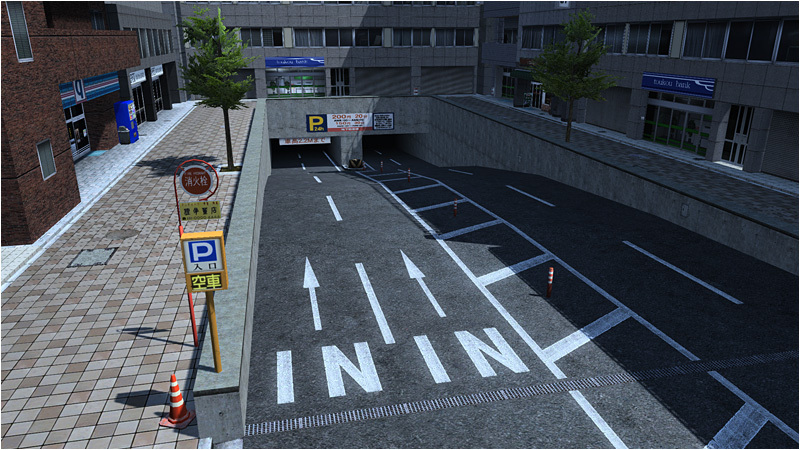 STage 6 graphics comes out with the PS4 release. If you don’t plan to get a physical version of PSO2 for the PS4 online, you will need a Japanese PSN Account (SEN, PSO2 only shows up in the Japanese PSN Store). You can create a Japanese account without a Japanese PS4, so there really isn’t much of a region lock holding people back. Game will still remain IP Blocked if you’re in the Southeast Asia regions (SEA) as per usual. I’m curious… does the commemorative bargain set count towards the current Ragol Memory campaign for purchasing premium sets since it includes a 90 day premium package, or is it considered wholly separate and someone would have to buy the premium separately to qualify? So anyone else having trouble logging in? i can get up to the login screen now, the ships are clearly green yet im getting a no error message sort of message :/ Anyone have any ideas? Anyone else keep getting a perpetual black screen after the opening logos/videos after the ep 4 update? I can’t get to the title screen anymore and all I can do is hit ALT+F4 and hear the PSO2 window pop up apparently asking me to confirm to kill the game. Probably a good time for missing files check. Well i took off all plugins, english patches to run the game. it took me to the log in i logged in and it said disconnected from server. I checked the proxy plug in and it was enabled in order to connect but tweaker said do not use plugins cause plugin status is unknown. Proxy server status has 0 online so that means it’s time for aida to do some work so we can play. Anyone else having trouble with PSO2es? It keeps giving me some pop-up when I try to log in, then takes me to the PSO2es google play page…. did they finally start checking where you’re playing it from and fully region lock it? Do you have the latest version? Could be redirecting you so you can update. So long you can get by without the assorted patches and plugins, sure. I don’t use any patch or plugin at all, only Tweaker. I’ll give it a try, thx. Is anyone else having trouble entering salon? It goes to black screen for me. Everything else works however. Yeah buying the 30, 60, or 90 day passes normally qualify you for the Ragol Memories campaign. The new bundle also qualifies as purchasing the 90 day pass, so you can go for it or the regular pass by itself. Anyway, my question may be stupid, I know, but how to get these special bonus coins for the new kind of missions (Lvl1 or more)? I’ve done some other missions but I didn’t catch anything like that. Somehow it’s still “sad” to do that to someone who saved so many people in three episodes before, I think. Anyway, I’ve finished the first Story Quest of the Episode and… I… Feel… Like… The Story will offer really strange things… Not to say stupid things. Welcome to the real world, virtual boy. Hey, you get a fancy new title and all! But even if it looks strange, it made me think of something… Remember the Matrix movies? Just imagine. 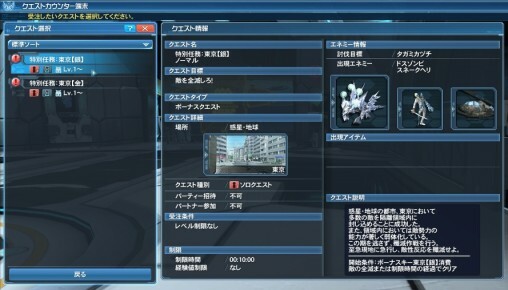 PSO2 world is the real one and Tokyo is a virtual existence like, for example, living in a server or a giant computer (Mother Brain pleaaase), and currently attacked by a virus or a something. It may sound stupid but I prefer this way of thinking the events and it seems as credible as the official scenario. But, after spending some time in Tokyo… We can notice the dinosaurs and other animals disappear in geometrical forms when they’re killed, like in… A video game? excuse me but this phrase doesnt seems to be worked when i type into the gamechat and press enter …is there any possible for me gonnna change to certain places in order to activate it ? For those word campaigns, you just paste and enter the phrase in chat and that’s it you’re done. Nothing will happen. You will receive the items when the maintenance comes. Every time I try to set my cast parts to work separately, it lets me save the option but then immediately puts them back. What do? Anybody else having trouble installing English patch and EN large files? Tweakers says they’re compatible but whenever I install mine, I can’t get past the magatsu video (black screen). Also, after uninstalling the English patches, I keep having missing files whenever I run a file check. I had a similar problem – what I had to do was use the official SEGA launcher -which patched some files. Then I ran tweaker, installed patches, and all works fine now. @SLAYME, I did that and it worked! There is one problem though, there are times that I get stuck after the magatsu video (black screen) or sometimes EVEN BEFORE the SEGA logo comes up, I always have to restart my pso2. It feels like it’s 50:50 chance that it will work ._. Will I be able to go back and view those episode 4 intro and unfreezing scenes when they get translated? Might have beaten me to it already, but I just discovered that saying ” ” will call out your own pet’s name in PSO2. Just saying if anyone knew this or not, especially notifying the people who don’t know about it. Can i ask what is the requirement to get Dailies Orders? Thanks. Daily Orders are unlocked after you clear the Free Field quest for Tokyo. i got error in this new patch. frist i download pre-patch before maintance and tweaker asking me again to update again. So i download it and there was 2729 missing file. after 2 hours later this masage come up and suddenly the patch done. 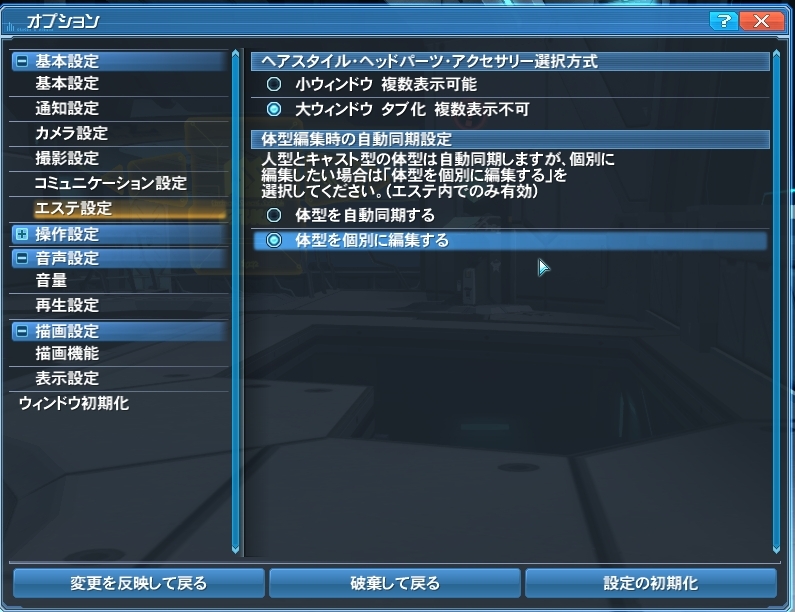 ERROR – Could not find file ‘D:\PHANTASYSTARONLINE2\pso2_bin\data\win32\ffbff2ac5b7a7948961212cefd4d402c’. 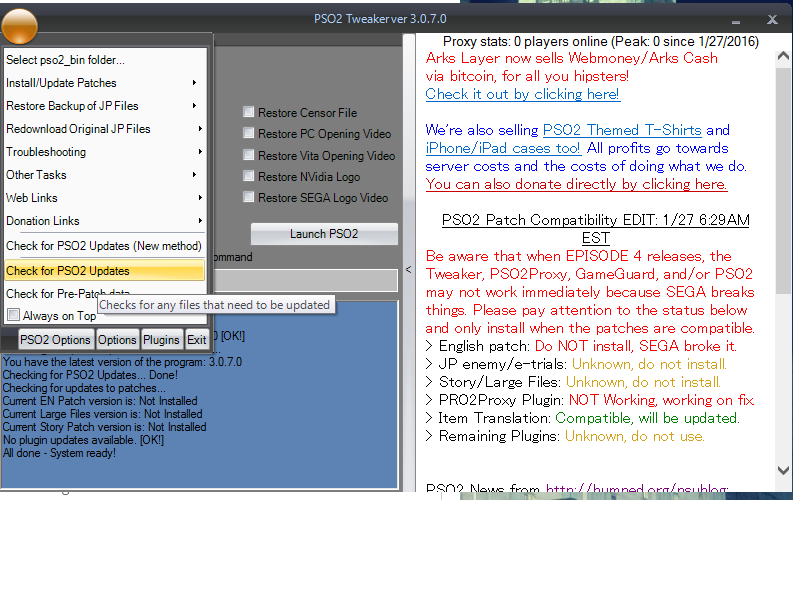 i press update pso2 new metode and it ask me again to download 2729 file again.